Combine all the marinade ingredients in a bowl and mix well. Add the prepared prawns, cover and marinate in the fridge for about an hour. For the curry, lightly salt the aubergine chunks placed in a colander over a bowl. Leave to sit for 20-30 minutes. Meanwhile, in a large frying pan heat the oil over a high heat. Fry the onion with the curry paste and curry leaves until the onions are softened, but not browned. Heat the oil for deep frying in a wide heavy-based pan until a breadcrumb dropped into the oil sizzles and browns (CAUTION: do not leave unattended). Pat the aubergine dry and wipe off any excess salt. Add the aubergine cubes to the oil in batches, and fry until golden-brown. Remove the aubergine from the oil using a slotted spoon and drain on kitchen paper. Add the fried aubergine cubes, chopped plum tomatoes and chickpeas to the softened onions. Add the water and simmer for 20-30 minutes, or until reduced and thickened. Just before serving, remove the prawns from the marinade. Heat a large griddle pan until smoking hot. 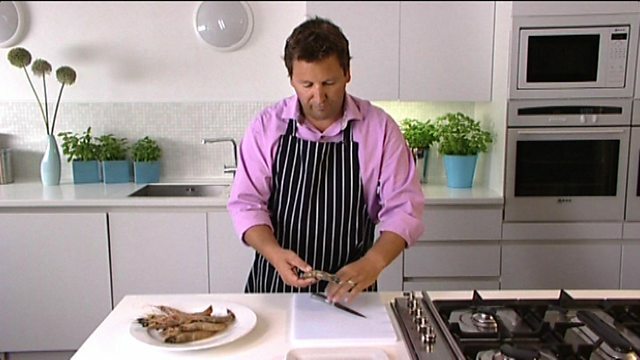 Add the prawns to the pan and cook for 2-3 minutes on both sides, or until cooked through. Stir the chopped coriander through the curry. Serve the curry topped with the prawns and with naan bread on the side.